The tweet below shows tributes to QEGS teacher Marian Page, who was found dead yesterday. 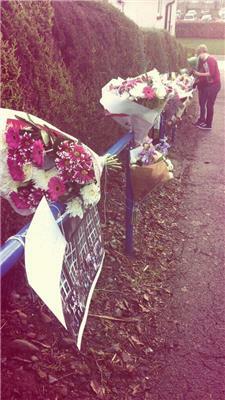 A Book of Condolences will be available in the Sixth Form Centre from tomorrow. Sellafield Ltd is hosting a 'learing beyond 16' event at the Marchon Club in Whitehaven tomorrow from 9am-3pm. Disruption caused by speed restrictions at Maryport has now ended, says Northern Rail. Services are no longer affected. The Abbey House Bed and Breakfast in Penrith was inspected by staff from the Food Standards Agency today. It was awarded the highest possible score of five out of five. Following today's News & Star story about a farmer who stole sheep and tried to sell them when they could have contained drugs that may be lethal to people being jailed, Cumbria Police have appealed for anyone with information on similar crimes to contact them on 101. Owing to speed restrictions at Maryport, trains are having to run at reduced speed on all lines, says Northern Rail. Copeland council can again take online and telephone payments after a system upgrade. People can also still pay at the Paypoint network of shops. He added: “Often these criminals will use back roads and commit rural acquisitive crime, including burglary, vehicle theft, farm thefts and scrap metal theft. They are opportunistic and think that by travelling to another county where they are less known that they are less likely to be caught. Operation Checkpoint aims to prove these criminals wrong." Insp Richard Quinn, of Cumbria police, said: "It is vitally important that we work together across county and country boundaries to target criminals. Criminals travel up and down our roads to commit crime – mostly thefts from rural communities. If criminals don’t recognise boundaries then neither should we." Cumbria police have joined forces with officers from North Yorkshire, Northumbria and Scotland to launch Operation Checkpoint, to target travelling criminals. About 90 officers from the forces are involved. The B5305 at Doctors Brow has now reopened, police have thanked members of the public for their patience. Retained firefighters will take to the streets of Penrith on Saturday to fight for the town's second fire engine. They will be on the streets, outside the town's cinema, from 10am and will march to the bandstand at 12pm, where they will stay until 4pm. The event will feature speeches from local MP Rory Stewart and parish councillors in support of saving the engine, as well as those who have benefited from it. There will also be live music and a DJ. Cumbria Cricket Limited and Cumberland County Cricket Club have announced a joint player development programme. This will work with players between the ages of 13-18-years-old who need financial assistance to develop their game. This will be funded through a lottery. For more details click here. Voting has opened today for the Museums at Night competition. Tullie House in Carlisle is competing with three other venues for the chance to work with Jessica Voorsanger, an American artist, who is based in the UK. Voting can be cast until 5pm, Tuesday, January 28. For more details click here. Inn on the Lake at Glenridding, near Ullswater. The search for him is being scaled down but Inspector David Willetts said: “We continue to appeal for anyone to with any information to get in contact.” Thomas is described as approximately 5 ft 11 inches with a slim build and short brown hair which is receding at the front. He was last seen wearing blue denim trousers, a long sleeved white shirt and brown shoes. Anyone with any information can contact police on 101. The B5305 at Doctors Brow has been closed while an HGV is recovered from a ditch. Drivers have been asked to avoid the area. A Silver Shogun, registration RV05 FGO was stolen from the Routhwaite area on Monday between 11:30 -11:45am. It was found at 1pm, on the same day, on its roof in a field between Appleby and Soulby following a crash. A 17-year-old man with short black hair, slim build, around 5ft 8 inches wearing a red top was seen near to where the vehicle was stolen and police believe there may be a connection between him and the crime. Anyone with any information has been asked to call police on 101. A missing woman from Kewsick has been urged to get in touch with her family or police. Elizabeth Fisher, 69, was last seen travelling from Lamplugh to her home in Keswick at 9am yesterday and has not been seen or heard of since. Family say this is out of character She is described as 5ft tall, with shoulder length light brown hair, slim build wearing glasses. She was last seen wearing grey trousers, a brown coat and a white scarf and driving a grey VW Polo (PX08 XFL). Anyone who has seen her or has any information can contact police on 101. The Police and Crime Commissioner's Community Fund organisers have issued a reminder that applications need to be received by the close of business on Monday, January 20. Details on this can be found here. Victim Support have reminded anyone in Cumbria who has suffered as a result of domestic violence, or knows someone else who has, that the group can be contacted on 0161 200 1950. The leader of Eden District Council is holding a public surgery this morning. Councillor Gordon Nicolson will be appearing at Penrith Town Hall from 11.30am-12.30pm. The British Embassy in Jakarta is tweeting about Cumbria. It told its followers in Indonesia and Timor-Leste "Taman Nasional Lake District di Cumbria Inggris akan mjd Situs Warisan Dunia UNESCO! ", which, according to an online translation is "Lake District National Park in Cumbria England will UNESCO World Heritage Site!". Their handle is @UKinIndonesia. Police have confirmed that a body found yesterday at around 2pm, has been identified as missing person Marian Page, 57, from Southwaite. She was found in the Castle Currock area. Police are not treating her death as suspicious and are supporting her family. Artwork by a University of Cumbria academic has been bought by the Henry Moore Institute in Leeds. Robert Williams is professor of fine art at the institution. The drawings are of bronze models of fruit. A University of Cumbria lecturer has been chosen become the first British-based academic attend a prestigious scheme at Harvard University in the USA. Professor Jem Bendell will take part in the Global Leadership and Public Policy for the 21st Century this March. To be selected participants had to show "leadership for the common good on a global stage". Mr Bendell said he was "delighted". A dog was struck by a train at St Bees railway station last night. It happened at 6.48pm. Cumbria police and British Transport Police dealt with the incident.